When the Barco iCon H600 hit the market in 2005, it was one of the first truly cloud-connected projectors. The H600, since retired, could display up to four data images, video or streaming media from any device or website connected to the network. The Barco projector offered a glimpse into the future of cloud-connected A/V, and as such, it carried an eye-popping price tag of $34,999. Flash forward to today, Barco is continuing to expand its advanced cloud-connected projectors, but it’s clear that the iCon H600 laid a strong foundation for Barco’s current line-up. For example, the iCon H600 enabled fast data sharing across the network. Images, video and streaming media could be pushed onto the display screen from the cloud, and any number of sources could be collected and added to the network. Remember, this was in 2005, before “cloud computing” had become a common tool for businesses. Plus, for a projector released more than a decade ago, the iCon H600 also boasted some impressive image stats, including a 6,000-lumen output, Full HD native resolution, and a maximum resolution of 2048×1536. In other words, the iCon H600 was a powerful piece of hardware designed for corporate presentations and collaboration. Even today, a decade later, there’s a lot to like about the H600. Advanced Networking: The iCon H600 was really one of Barco’s first steps into cloud computing, and it was a master at that. Essentially, the projector connects to the cloud via a device, and thus, data from millions of sources that were connected to the cloud could then be pushed to the projector. Plus, a range of devices could be connected to the network — from smartphones, to laptops, to desktops — enabling faster data visualization across organizations. For 2005, this feature was extremely advanced. Impressive Picture-in-Picture: With the ability to project four images from different sources simultaneously, the H600 really pushed the envelope as a presentation tool. Plus, the four images could be a variety of media — for instance, two data images, a streaming video, and a video. 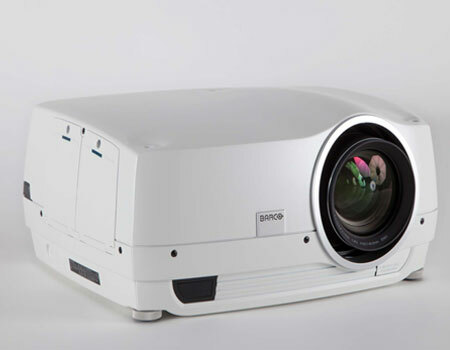 A Bulky Design: Barco projectors are, in general, heavier than projectors with similar specs. That’s certainly true of the iCon H600. At 11-inches, by 23-inches by 24-inches, and weighing 77 pounds, the iCon is a boulder of a projector. Therefore, this isn’t built for portability. It’s a permanent installation piece. However, this model comes with interchangeable lenses depending on your application, so it is more customizable than most projectors on the market. Bright, Full HD Image, Average Lamp Life: Projecting a 6000-lumen image, the iCon H600 is powerful enough to handle mid- and large-sized venues, with moderate amounts of natural light. It also has a native resolution of 1920×1080, as well as vertical and horizontal lens shift. The only catch: At this brightness level, the iCon H600’s lamp life is average, if not slightly underwhelming. The Barco H600 bulb is a 300-watt UHP bulb otherwise known as R9841829, and as the iCon H600’s replacement lamp and housing module are on the higher end, the maintenance costs are a bit more expensive compared to more affordable projectors. The entire Barco iCon series, which the H600 was the last iteration of, was a powerful cloud-connected tool, delivered at a time before cloud computing was so widely available. Really, it’s a relic of a nascent technology, and it really shows the starting point for Barco’s contemporary cloud-connected projectors. Today, used Barco iCon H600 devices are available online, sold primarily by third parties. Would a used H600 be worth it today? It might be. If the price is right. The technology is still extremely useful today, but in general, the offering prices for used projectors in the Barco line can be quite expensive. Plus, today, technology has gotten cheaper. You can find a variety of Full HD projectors with multi-window capabilities, like the Panasonic PT line, however, depending on the components you require, your application and the price, the Barco might still suit your needs. Barco has a storied history of producing some of the most powerful and high-impact corporate A/V projectors on the market. One of their earliest forays was the iQ series, with the iQ G300 being the first available in 2003. 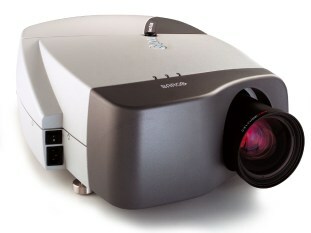 The Barco iQ G300 was one of the first projectors with advanced picture-in-picture, allowing four scalable images to be displayed simultaneously, or two data images alongside a video image. That functionality made this an ideal collaboration tool for businesses, as a range of data sets could be shared at the same time. Barco’s commitment to projector collaboration tools has continued, even as the original iQ line has been discontinued. In 2013, Barco launched the Collaborate line, featuring the CRPN-52B, a powerful panorama projector with an even great suite of advanced multi-window capabilities. Comparing the iQ300 to Barco’s 52B offers a wonderful example of just how far the company’s small- to mid-sized venue collaboration tools have come. Released a decade apart, the two projectors share similarities, yet, it’s easy to see the decade of difference. Brightness and Contrast: When initially launched, the iQ G300 featured a brilliantly bright image. The projector was rated at 3,500 lumens but delivered a contrast ratio of just 400:1. In the last decade, the power of single-chip DLP technology has moved forward. The 52B, for example, although featuring a much larger native resolution, has an output of 5,000 lumens and a contrast ratio of 6,500:1, thanks in part to greater wattage lamps. The similarity is that both employ Barco’s signature dual-lamp configuration. Image Quality: The iQ G300 has an XGA native resolution (1024×768) compared to the CRPN 52B’s panorama resolution of 2560×1080. Thus, the 52B boasts enables enhanced multi-window clarity compared to its predecessor. Both are capable of completely filling the screen, with sustained corner sharpness. Yet, in the lower resolution, some detail can be lost when using the advanced multi-screen modes. Lamp Life: Both projectors use dual-lamp systems, which are designed to improve lamp life by switching between light sources after 100 hours of use. The iQ projector features two 200-watt UHP lamps, while the newer model uses two 300-watt UHP lamps. Yet, the 52B achieves longer lamp life due to improved efficiency. The 52B in standard mode achieves 2,000 hours, while the iQ is right at 1,500. Additionally, the 52B achieves a much longer life when using single-lamp mode: 5,000 hours compared to 3,000. Collaboration Capabilities: In 2003, the iQ G300 was the first projector of its kind, allowing advanced picture-in-picture and the sharing of four pictures at the same time. With built-in source switching, the iQ was able to quickly toggle between sources. The CRPN-52B has transformed that original concept. Now it’s possible to have multiple windows open, quickly toggle between them, and display a greater range of windows on the same screen. Plus, the 52B’s panorama resolution enhances the picture quality in each window. Pricing: Barco is a major player in the high-end projector market, and both of these pieces of hardware were offered with eye-popping price tags. In 2003, the iQ G300 carried an MSRP sticker price of $13,500. A decade later, the 52B started north of $24,000. Comparing these high-end Barco projectors is a useful for seeing just how projectors have advanced in the last decade. What was possible in 2003, now seems underwhelming. At the time, the iQ G300 and the rest of the iQ series were powerful tools that set a new precedent in multi-window projection. Barco has continued to advance and innovate, and the current Collaborate line really highlights their commitment. We’ll just have to wait and see what’s next from Barco.